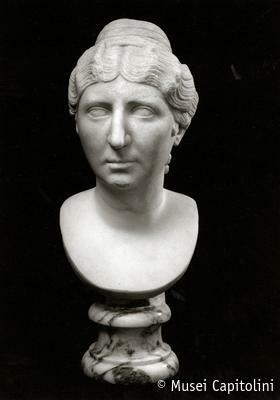 The bust portrays a mature woman whose elongated, oval face, is characterized by wide eyes, prominent nose, receding chin and tight lips. The hairdo is in the fashion of the early Antonine period; the hair is parted in the middle with soft waves that follow the profile of the skullcap up to the ears; on the back, they are cropped up in a braid that ends in a top-knot resting on the nape. The sculpture dates back to the early Antonine age.